The family owned distillery has won more top awards this year than ever before with the latest, a double win at the Scottish Field Whisky Challenge, to add to the trophy cabinet. 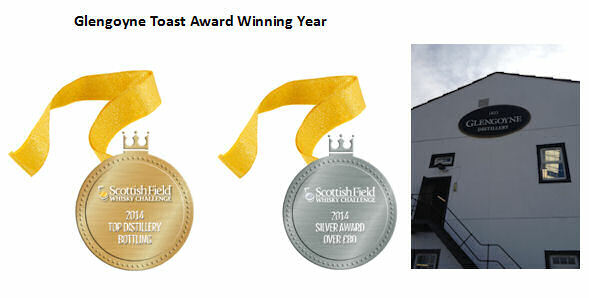 Glengoyne 25 Year Old was awarded the Top Distillery Bottling and a silver medal in the Over £80 category. The Scottish Field Whisky Challenge is now in its fourteenth year and is a key event in the Scotch whisky trade calendar. The winners are chosen through blind tasting by respected industry judges meaning the whisky is chosen solely on its own merit. Glengoyne is owned by one of Scotland’s leading, independent, family-owned distillers, Ian Macleod Distillers. Glengoyne is handcrafted from the finest sherry casks within Glengoyne’s traditional dunnage warehouses. Unlike most other single malt whiskies, Glengoyne dries its malted barley using only warm air resulting in a subtle yet complex malt where all the delicate flavours are freely expressed.